City University London's 2014 Wind Turbine Design Challenge will take place from the 21st to the 24th of January. 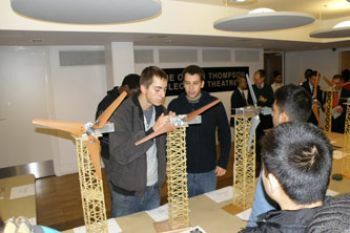 City University London's 2014 Wind Turbine Design Challenge takes place from the 21st to the 24th of January. This competitive event is devised and organised by Professor Keith Pullen, Professor of Energy Systems and Dr Youyou Yan, Lecturer in Mechanical Engineering. It offers small tutorial groups and teams of undergraduate mechanical engineering students the opportunity to design, construct and test a small wind turbine for lifting a 2kg weight. "This year's Wind Turbine Design Challenge presents an ideal environment for first year students to gain an understanding of the real complexities and issues that engineers have to grapple with. Beyond this, they will have the benefit of using the excellent research facilities, interacting with their peers in teams and consulting with experienced academic staff." The 2014 Wind Turbine Design Challenge is supported by a large number of staff in the School of Engineering & Mathematical Sciences and by global engineering consulting firm, Mott McDonald. The latter are providing cash for the prizes for the top performing teams and a professional engineer as a speaker who will explain the design and installation of wind farms in the UK and careers in this industry.